Net66 SEO: Is Google Deliberately Harming Organic Results? First of all, The Fold, is what’s immediately viewable on your screen once you’ve performed your internet search (Googled something). If you have to scroll down to view past the paid for content and Google’s own maps service, what does it say about Google’s attitude towards the SEO industry? > A Carousel. The only purpose this seems to have, is to promote you to refine your search. Each image on the carousel is tied to a different Google search so if you search Hotels (in the example image) each image at the top will have a different search attached to it. Such as “Boutique hotels”, “5 Star Hotels” etc. > Google Ads. 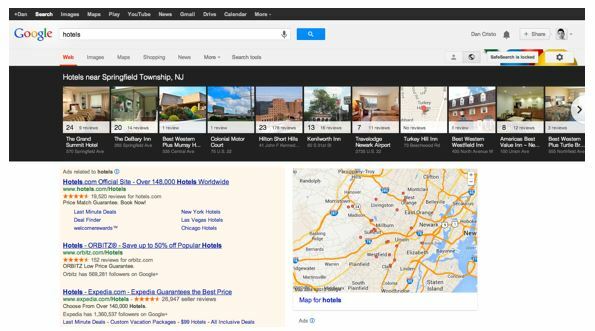 In the bottom left of our example image you can see the bottom left is dominated by Google’s Adwords. A larger than average box ensures that it takes up all the space it can. > Google Maps. Although we set up Google Maps originally, we have no say whether or not our maps will be chosen with no real way to optimise them. This, again, relies solely on Google. So what do you think about this new first page Dominance by Google? Is this a deliberate attempt to discourage the SEO Industry? Or is this just simply Google trying to improve search results for us?